SMALL IN SIZE, MIGHTY IN SOUND | The TRE10db is the perfect chime for the percussionist with a large setup and not enough room for a full-sized chime. 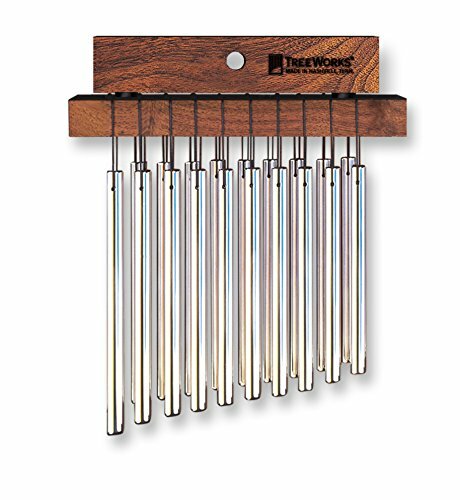 The doubled rows of bars help this smaller model project and cut through the crowd, making it ideal for a shorter chime twinkle. PROUDLY MADE IN THE USA | Each TreeWorks Chimes bar chime is made from Tennessee hardwood and locally sourced aluminum/titanium and is assembled in our workshop just north of Nashville, TN. HAND-CRAFTED FOR SUPERIOR DURABILITY | Long-lasting braided CordLoc is used to suspend out 3/8" thick Aluminum/Titanium alloy bars on a hand-finished Tennessee hardwood mantle. Each chime features a 7/16" hole in the mantle for mounting on cymbal stands or our unrivaled TRE52 chime mount. Unlike other brands, we always source our materials locally and reject the use of plastic ties to secure our bars to our mantles.